Do you have a dress that doesn’t fit? Do you have a shirt that’s too big? Wait – before you throw them out, see if you can’t add some part of them to a tee. This is the best part of recycling, when you can incorporate something old into something you already have, making something totally new to you! I found this orange shirt and this flower summer dress at the thrift store this past weekend and figured I would use the dress for some more aprons (I have an unhealthy obsession with aprons). I never realized until I got them home that the orange color in the dress matched the shirt perfectly. Knowing I only had plans for the bottom of the dress I figured I should somehow incorporate the top part of the dress into the shirt. I wish I had a better picture of the shirt and dress side by side. 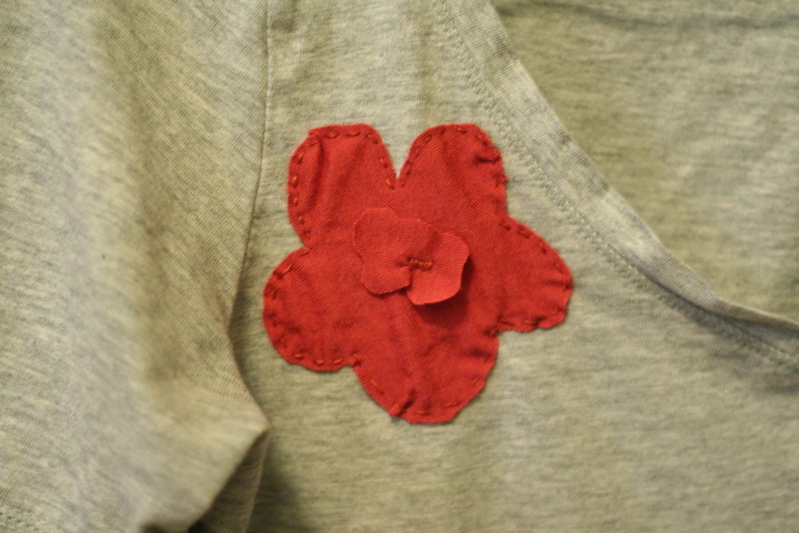 So much cuter than the plain tee it was before! 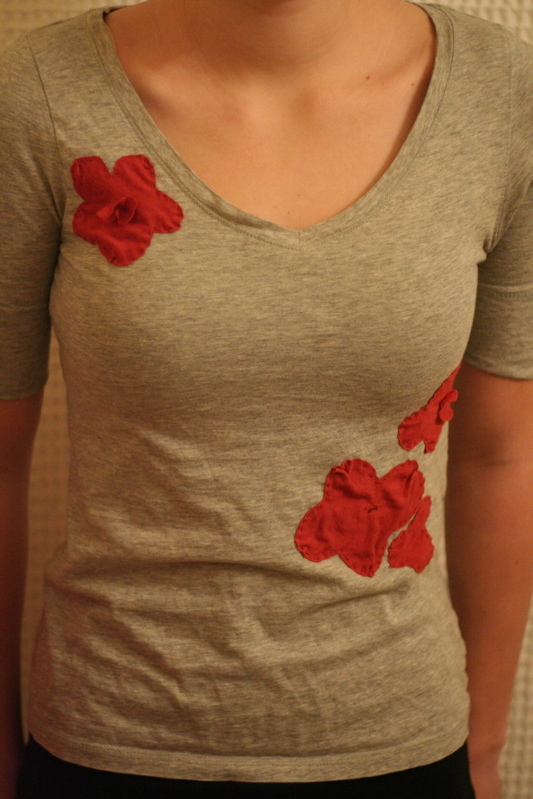 This was a super easy shirt to make. 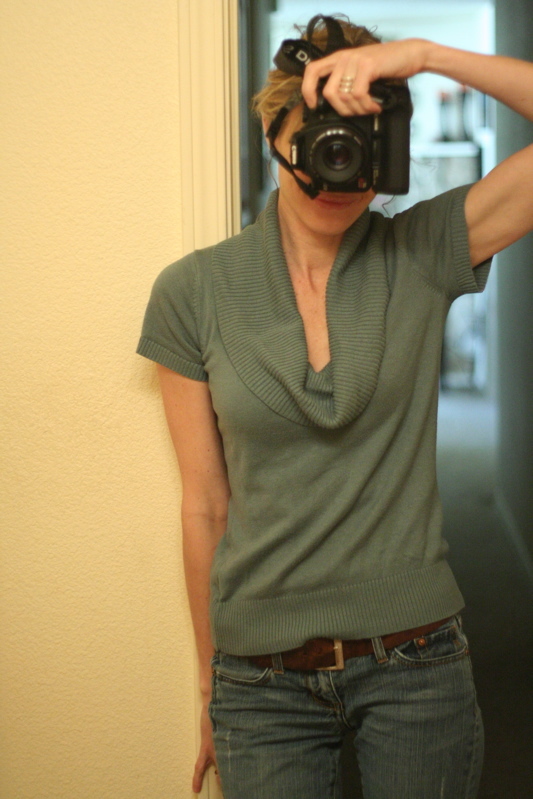 I cut the sleeves off the tee at the seam, sewed on the sleeves from the dress(I seam ripped those off). 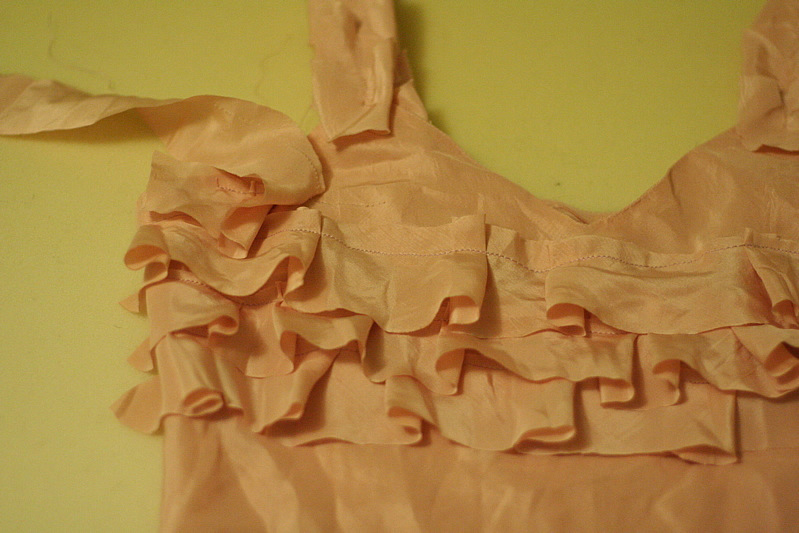 I cut off the neck section because it had such a nice seam and used that for the ruffle. And used the back ties for the front tie on the shirt. 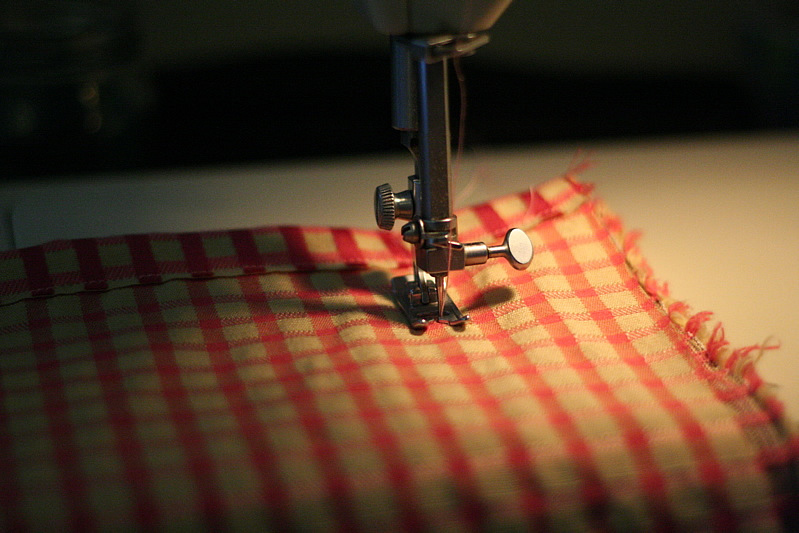 Super fast because most seams were already done for me. Try this on your own. If you come up with a great shirt, or shirt-dress or whatever, please share with me. I would love to see photos and will put them on the blog to share with everyone. This entry was posted in Check this out!, DIY, I made this!, Recycled, Thrift Finds, tutorial, upcycle and tagged aprons, orange color, orange shirt, summer dress, thrift store, unhealthy obsession on March 30, 2010 by Deanna. I was so excited when I found this sweet little sweater. Its adorable and perfect for spring. I cant wait to wear it. Its still a little cold outside but it wont be long before I can slip this on over a floral print dress. Perfect condition, like it had never been worn. I love these flower details. And a little button closure. 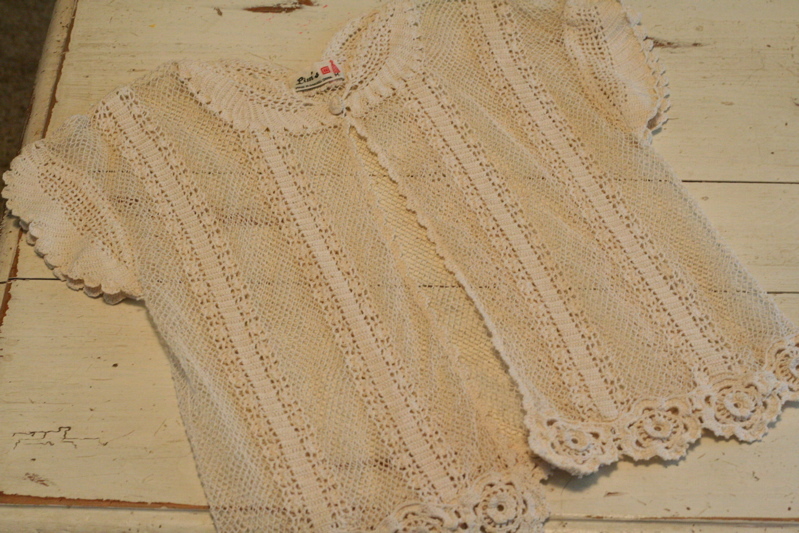 This entry was posted in Check this out!, Thrift Finds, vintage on March 11, 2010 by Deanna. I have this beautiful niece who gives me clothes that she no longer wears or doesn’t like and this week she gave me this really cute strapless dress with a side zipper. 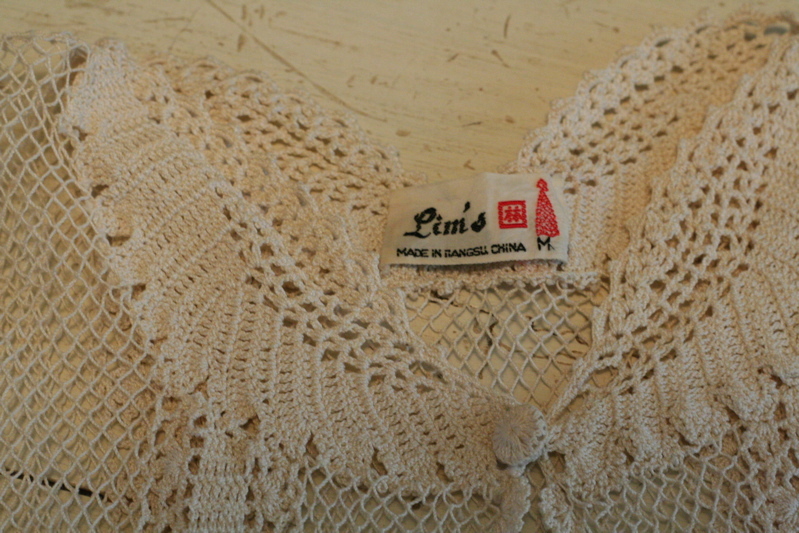 I love it but for me I knew I would never be comfortable wearing it without some sort of strap. I had this scarf that I had found while thrifting a while back and decided to try some different ways of adding it to the dress for straps. 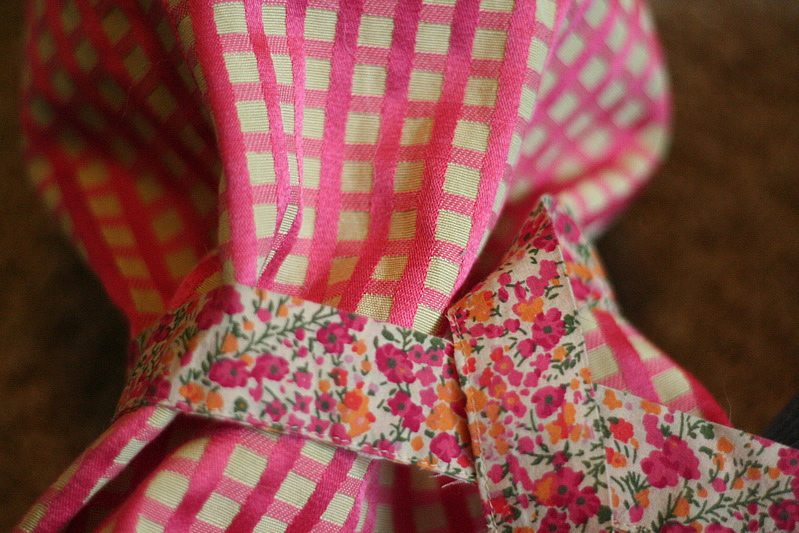 I sewed and seam ripped and sewed some more before I decided to do plain old straps. I added this tulle to the bottom and then took it off because it just didn't look right. 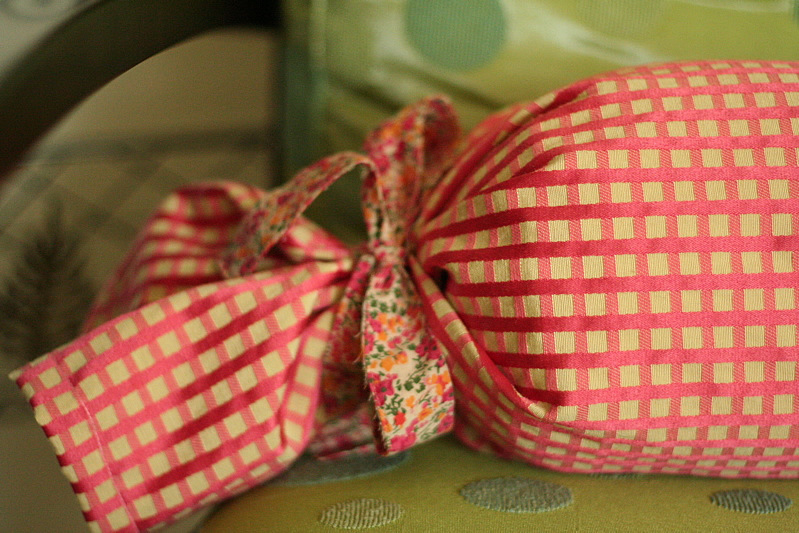 And here is the AFTER photo with the scarf straps. Another self portrait, sorry. This entry was posted in Check this out!, DIY, Thrift Finds, upcycle on February 27, 2010 by Deanna. 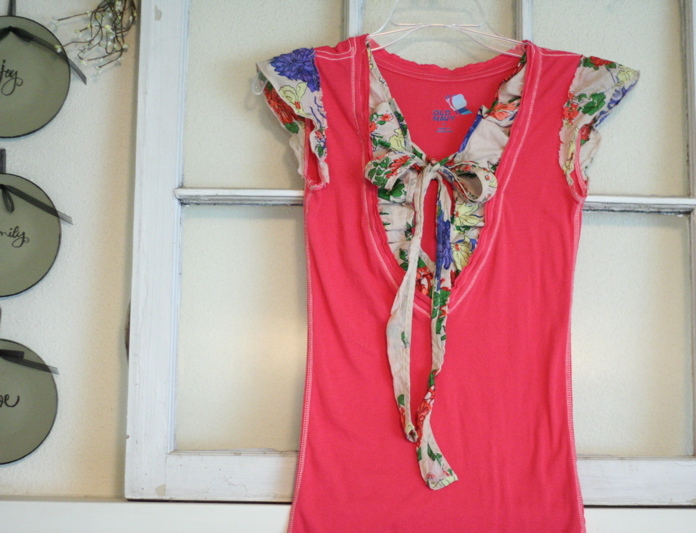 I love looking at the clothes in the J.Crew catalog and while I was looking I came across this silk tank top and I remembered this vintage silk slip that I had found a while back, dug it out and decided I would turn it into this. Who knew silk was so hard to sew. 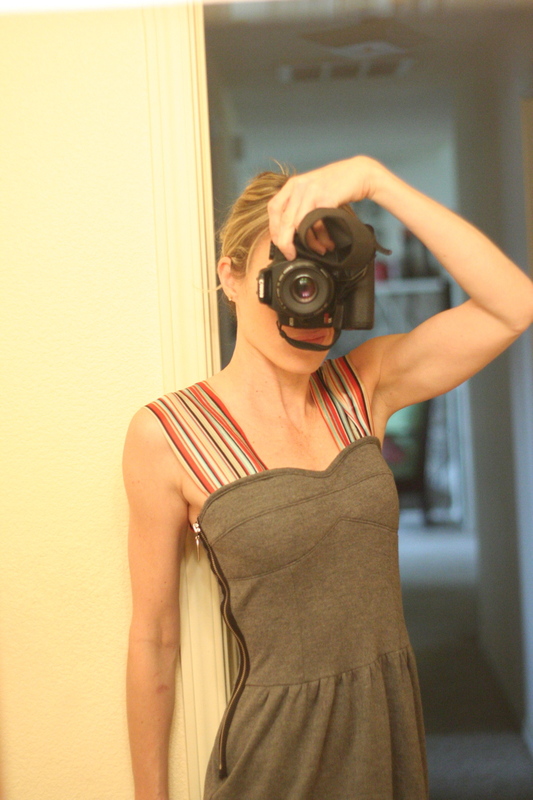 The silk tank from J Crew. 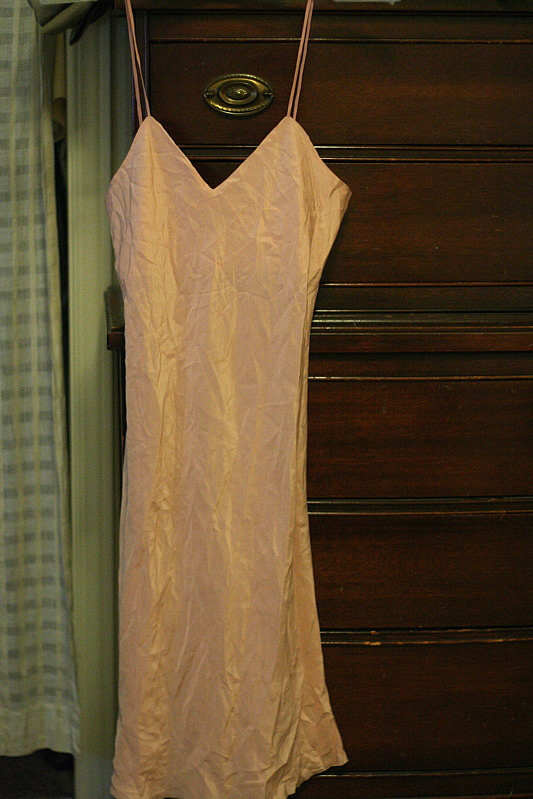 This is the vintage silk slip before. I cut the slip in half and cut the bottom half into 2 inches strips. 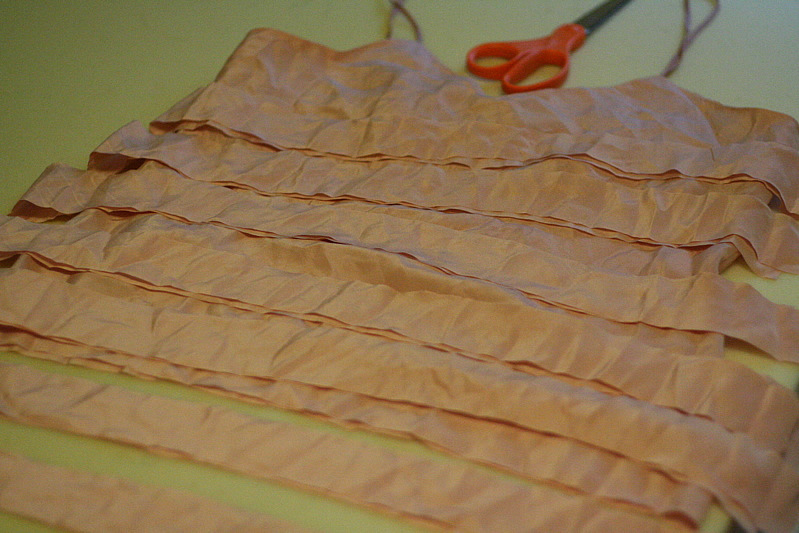 For the straps I sewed strips of the silk, folding them over as I went to mimic those of the J Crew tank. 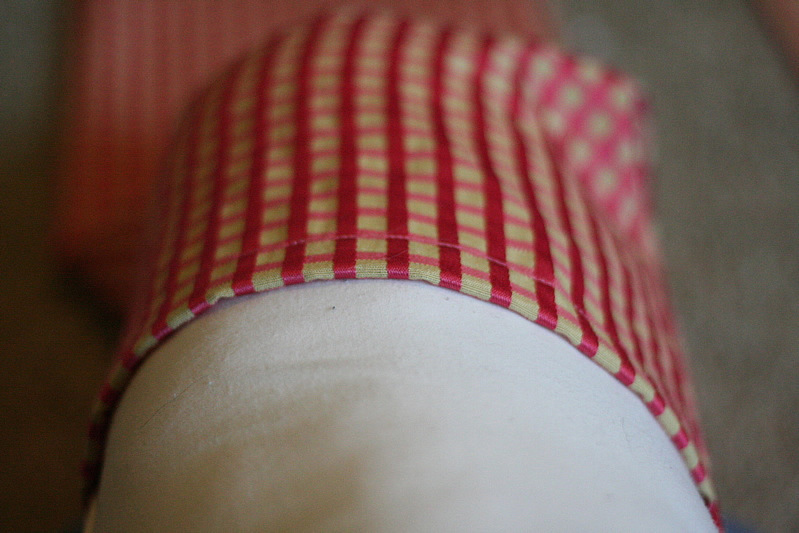 I started sewing the strips on at the lowest point first while ruffling different points. The silk tank I created. And the bonus is that I have some silk left over to use as roses for a head band or I could add a rose to this tank. This entry was posted in DIY, I made this!, Recycled, repurpose, Thrift Finds, tutorial, upcycle, vintage on February 24, 2010 by Deanna. 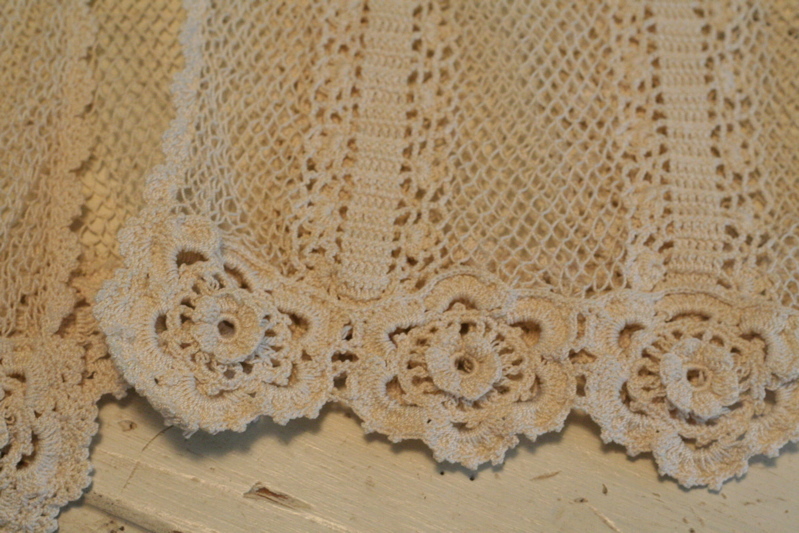 About a month ago I found this vintage lace slip that I fell in love with but wasn’t sure how to make it fit me or how to wear it. 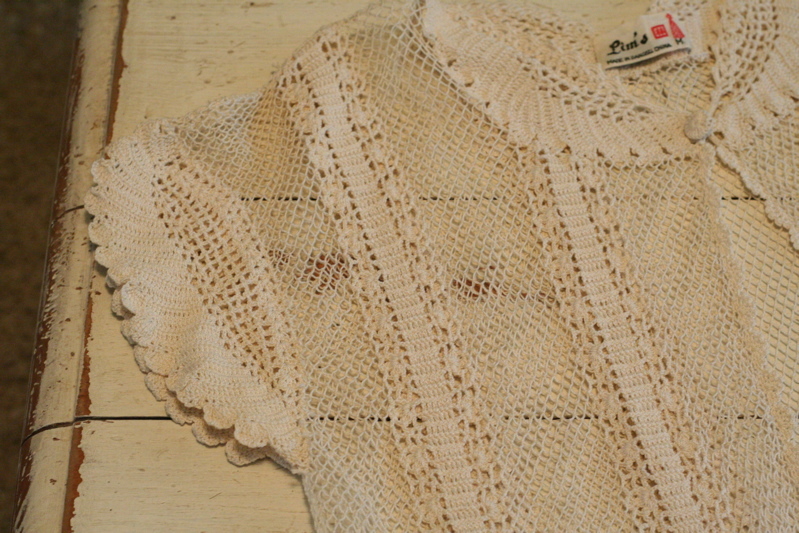 I contemplated cutting the slip apart but some of you suggested I leave it as it is and wear a long sweater over it. Well today I found just the right sweater. I obviously had to sew in the bust of the slip a bit because I wasn’t blessed with an overabundance in that area. I was a bit worried when I first started sewing but the slip turned out to fit very well and looks really cute under this sweater. 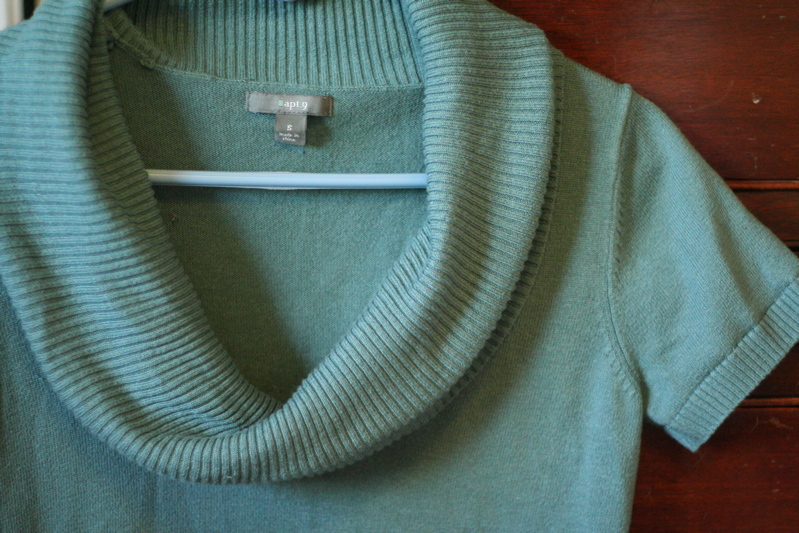 And the bonus is that the sweater was also a thrift store find. 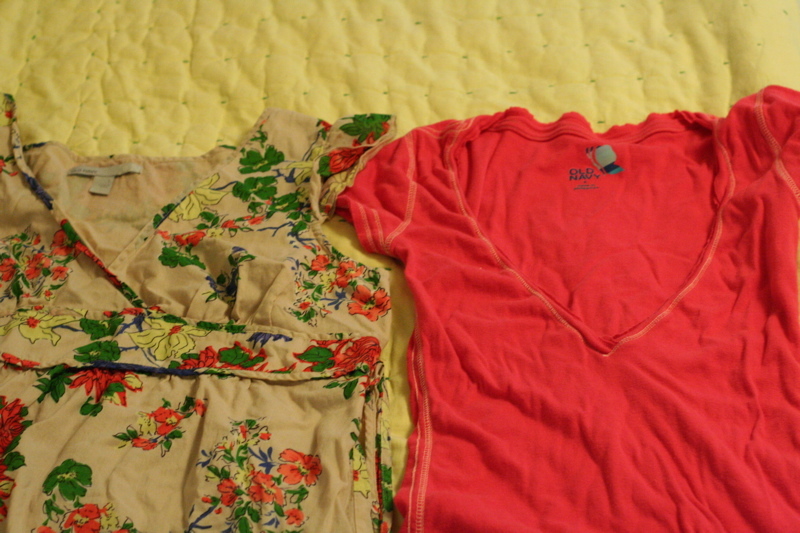 This entry was posted in Check this out!, My duds, Thrift Finds, upcycle, vintage on February 23, 2010 by Deanna. I have been looking at the future with a little apprehension, knowing that there are a lot of changes coming my way, hard changes, ones that cause me to want to climb back into bed and stay there until they all disappear. Well it doesn’t work that way. Changes come with life, that’s just the way it is. So I’m getting out of bed and going to be a big girl and face these changes head on. Well one change I don’t mind making is the changes that I make to clothes, I love making clothes look new and different. 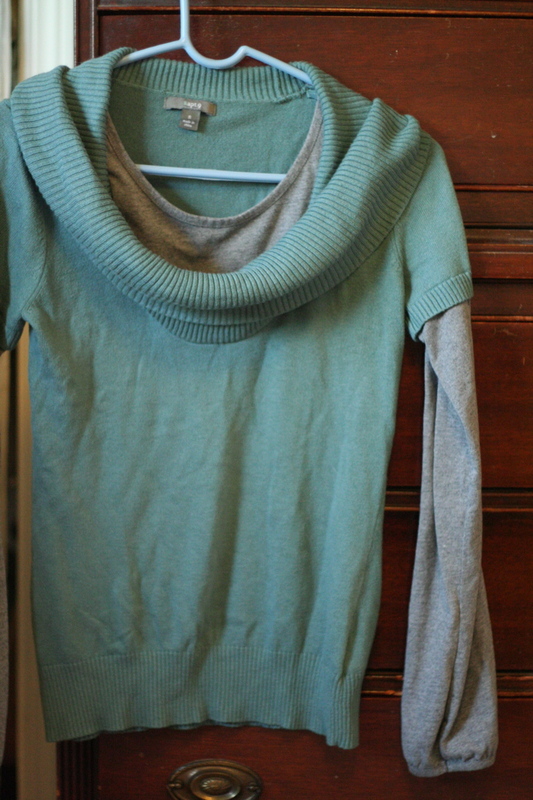 Last week I found this cute sweater and I knew right off that I would have to change it up a bit. It was super easy – here is what I did: I just took my handy dandy seam ripper and took the sleeves and neck piece out – that simple! Sorry had no extra hands to take the photo. Much more sophisticated dont you think? 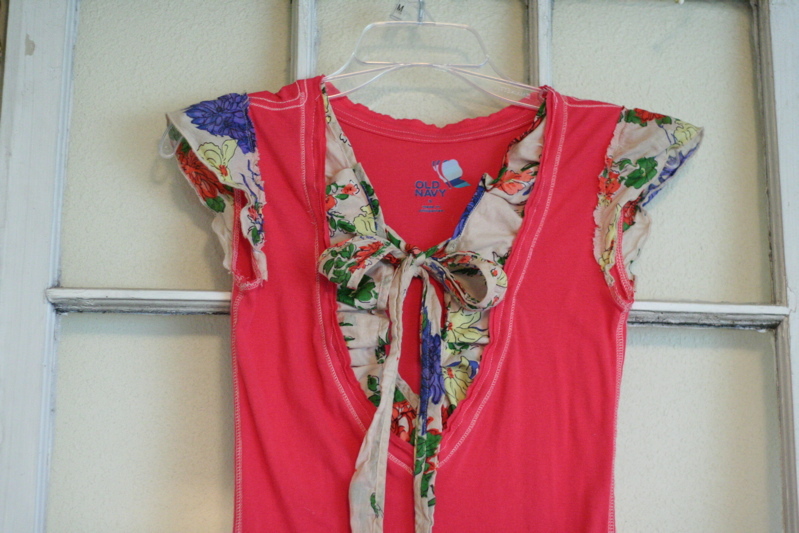 This entry was posted in DIY, My duds, Recycled Finds, Thrift Finds, upcycle on February 18, 2010 by Deanna. 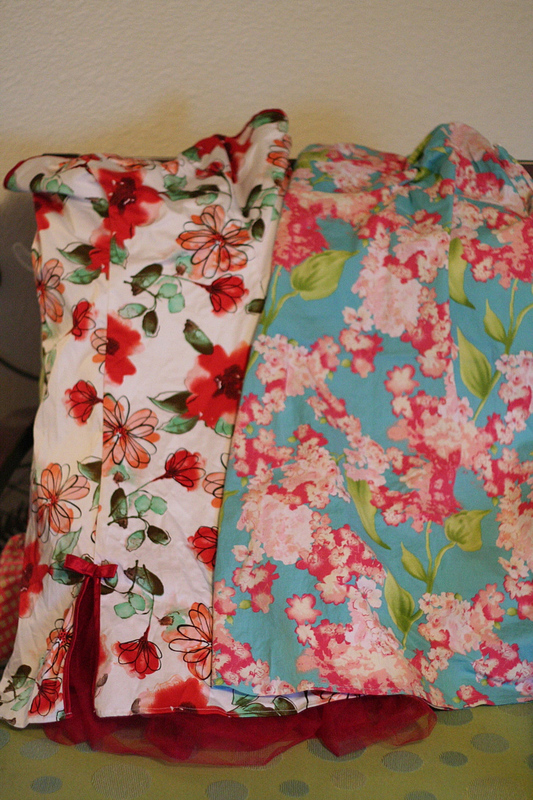 I found these two sundresses at the thrift store and loved the material and thought they both could be used for apron material. I started with the red flowered tulle one and am still working on the blue one. I just love the way it turned out. The next one I do will have instructions. It was super easy! Check back. 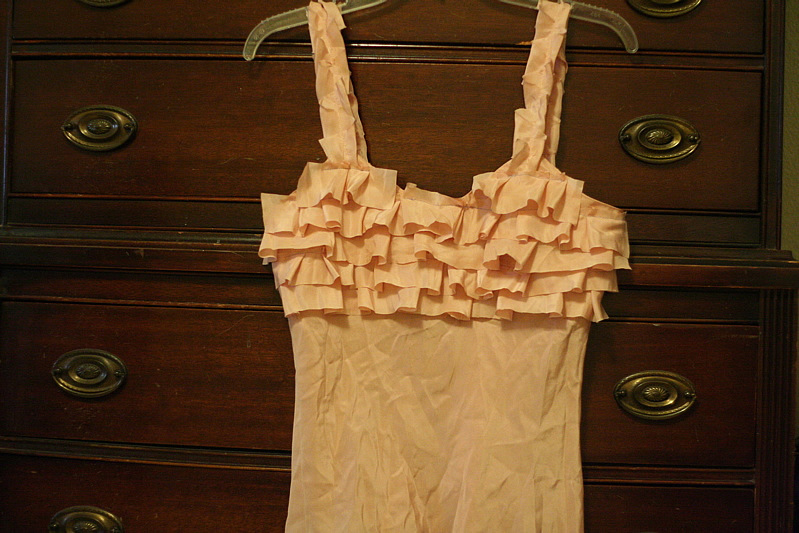 This entry was posted in DIY, I made this!, Thrift Finds, upcycle on February 16, 2010 by Deanna. 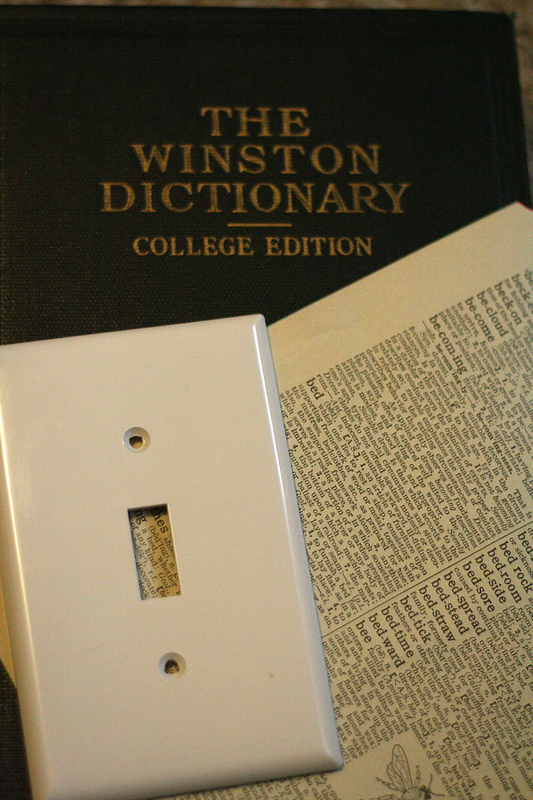 I found this Winston Dictionary at the Goodwill with my mom yesterday. She is a lot of fun to look at books with. Constantly picking up books that she thinks I need. Yes I walked out with a book with the title of “Simple Ways to Make Your Husband Feel Great”. Oh Mom – you are so funny! Anyway… I bought this dictionary for one purpose, to cut up and use for projects. At this cute little gift shop I was at yesterday I saw a light switch cover that had been covered with valentine hearts. I thought it was a great idea and knew it would be super easy. So with a little Mod Podge in my hand I started on one for my bedroom. You can use whatever paper you would like, I chose the page from the dictionary that had Bed on it. 1. After you choose what paper you want to use, trace around the light switch on the wrong side of the paper, then cut 1 inch away all around the traced lines. In the middle where the switch goes, cut diagonal across each way. 2. 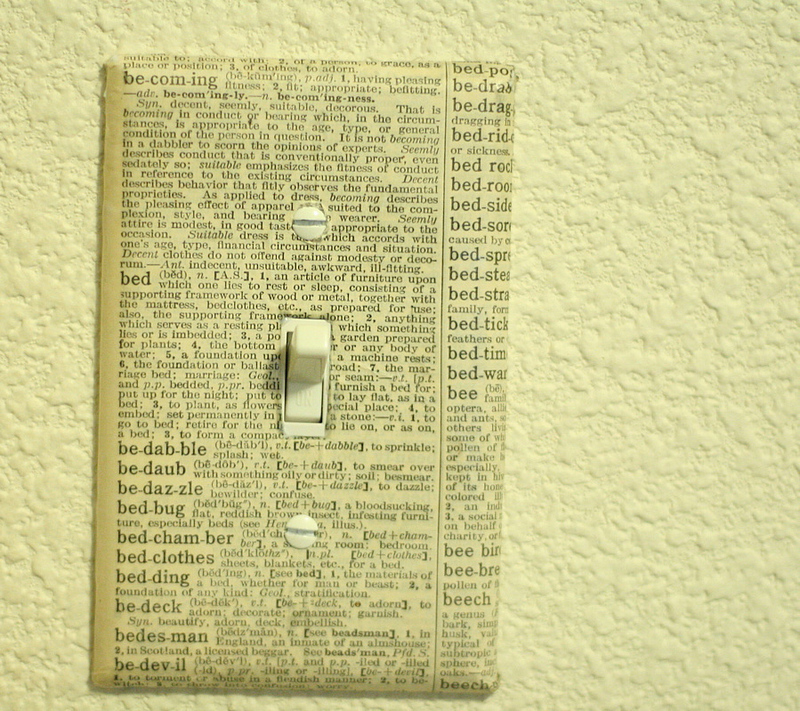 Cover the light switch with Mod Podge and stick the paper to it. 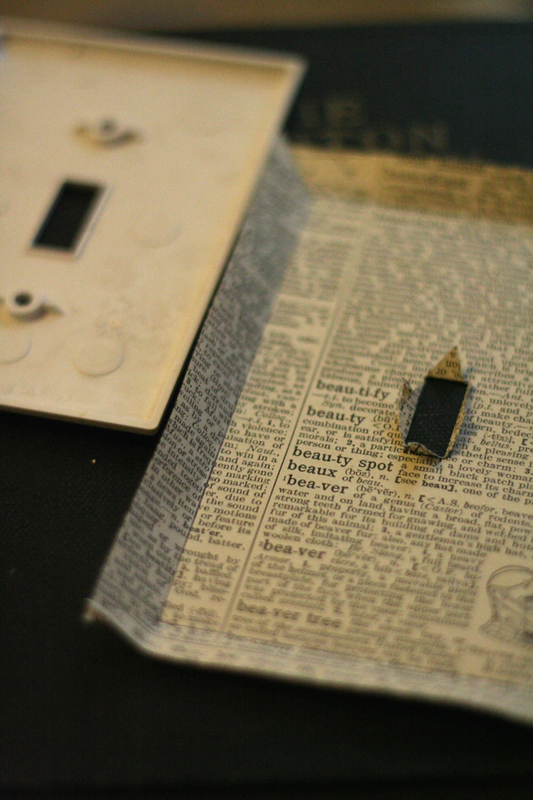 Fold the edges over and pull the little pieces through the switch hole and secure with more Mod Podge. 3. Let dry completely(about an hour) before putting on your light switch cover. 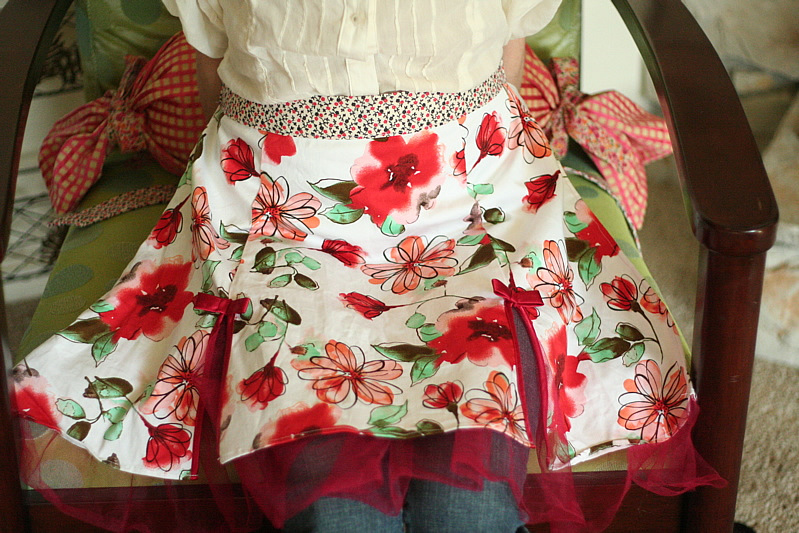 This entry was posted in DIY, Thrift Finds, tutorial, upcycle on February 12, 2010 by Deanna. I made my way to a Goodwill Outlet yesterday that was way out in the sticks but people have told me its the best one in the area so I finally got out there to check it out. They were right it was pretty good. I found this amazing checked upholstery material. 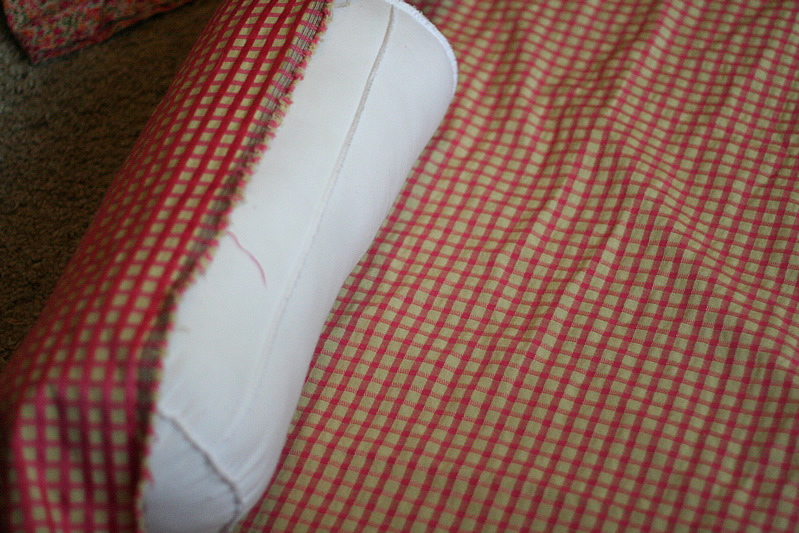 I also found a bolster pillow form. So you put the two together and what do you get? I found a cute shirt that matched the upholstry material and decided it would work great for ties. I measured the material, making sure I didn’t cut too much off, in case it didn’t fit properly. I like to leave room for mistakes. 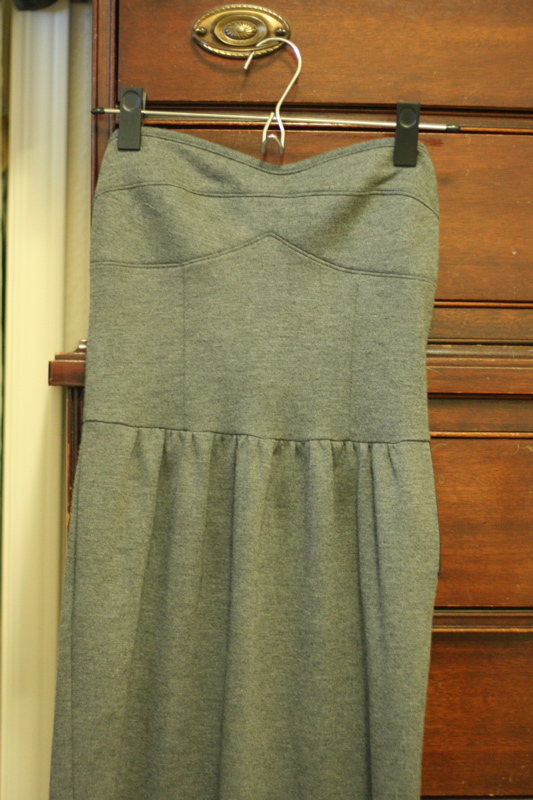 I sewed the ironed and sewed the ends. 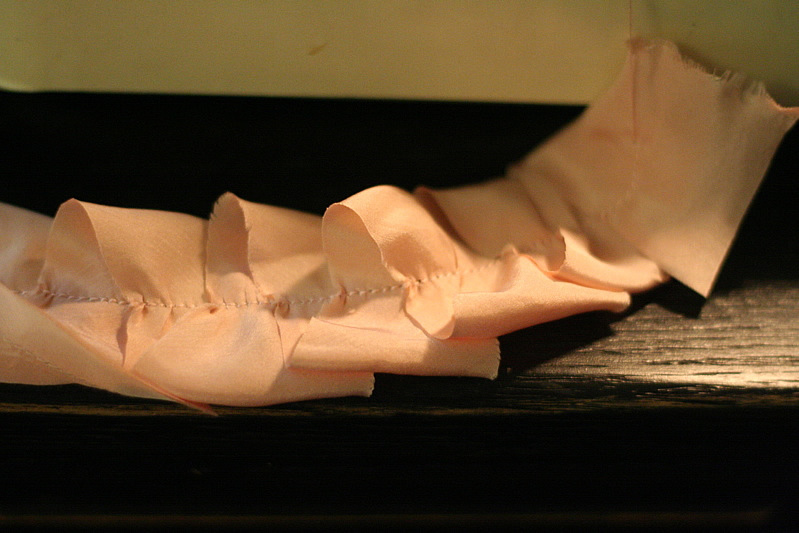 Then I sewed the material into a tube to fit around the bustle form. I pulled the material onto the bustle and it fit perfectly. I cut strips off the shirt, I didn’t finish the edges, I didn’t want this to be a long project and the frayed edges give it a relaxed look. And this is how it turned out. 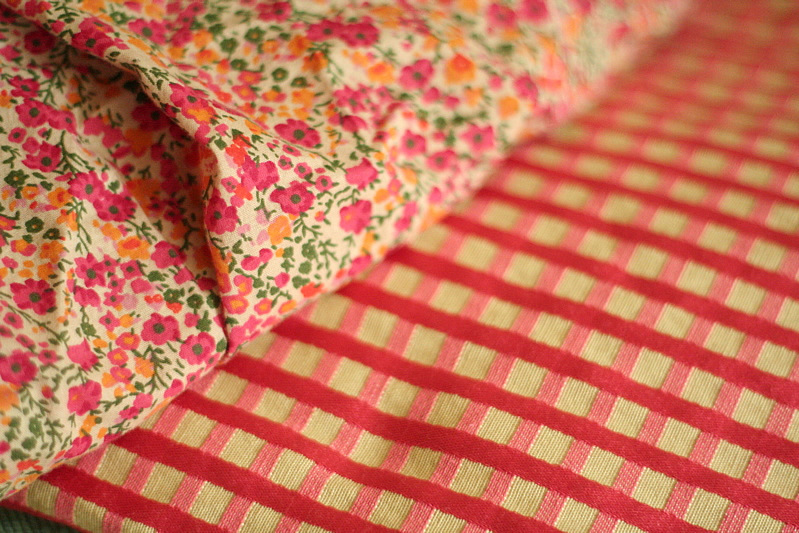 I love the colors, perfect for spring!And it seems spring is coming sooner than it normally does. 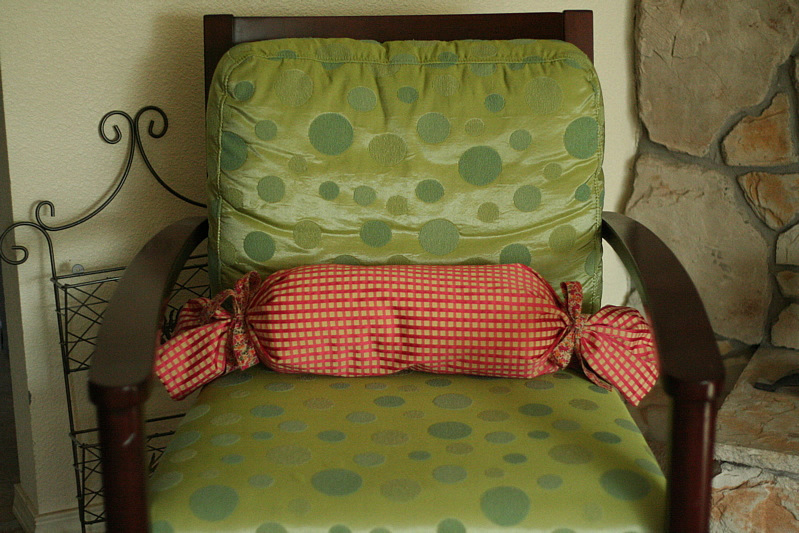 This entry was posted in DIY, I made this!, Recycled, Thrift Finds, tutorial, upcycle on February 5, 2010 by Deanna.